So here are the details on Record Store Day and our 1st “re-birthday” at Backbeat. Fancy poster to come later – we just wanted to get the details out today since we promised you all. Weekend sale and live music all afternoon! – Plus we will have several crates of records for $2.95 each and you get the 25% off these too! – All in-stock Pro-ject, Rega and Music Hall turntables will have ridiculous discounts that you have to come in to see. – 20% off all used turntables and amplifiers. – All new CDs 20% off unless already discounted further. All sale prices exclude special orders and are limited to on-hand inventory. That’s the only catch! 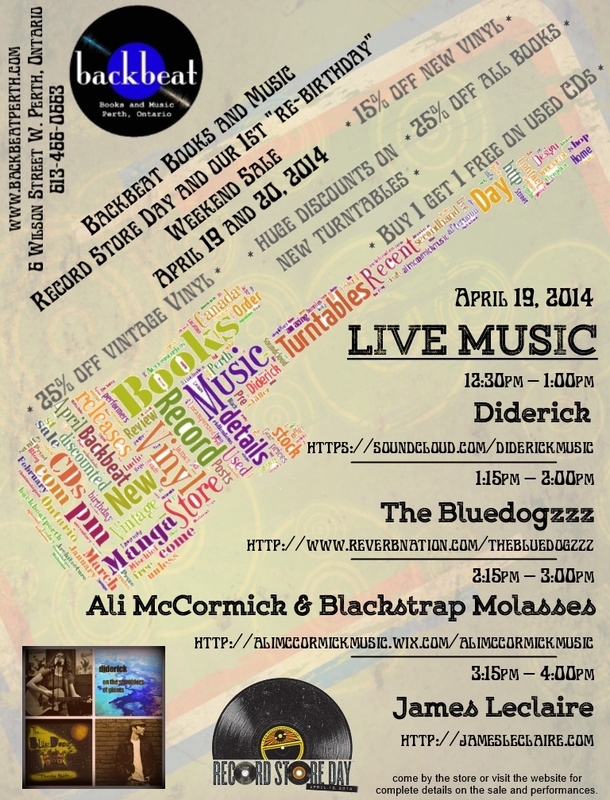 There will be live music at the shop for the entire afternoon on April 19th, 2014. We are so lucky to have such amazing performers coming in to put on a show for our great customers. It’s going to be a pretty amazing weekend, so we really hope to see you all there! Previous Post Manga! Manga! Manga!